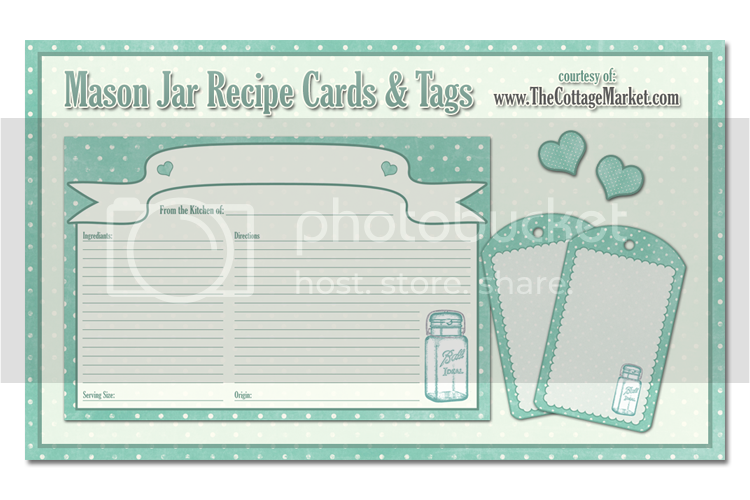 I have something for you that I hope you enjoy…a fun recipe card and happy tags featuring everyone’s favorite mason jar. Share them with family and friends and use them in good health! You are going to love these large adorable tags and don’t forget you can also make them smaller! If there is a shower coming up in your life…print these out so everyone can share their recipe with the bride-to-be…so many possibilities! Just click into the post for the downloads…Have fun! Just follow the clicks and print as many as you like! Share with others…there is no limit…the only thing we ask is not to sell them in their digital form…that’s it! Thank you so much! These are just great, and you are very kind for offering them! Andrea, these are so cute and it was so easy to link it to my photobucket albums. I followed you and you may follow me, if you want. 🙂 I’ll admit all of mine aren’t originals but some are, I guess I should create an original file but the only thing I have that is original would be photographs that have been “dr’d”. Thanks for sharing! I was looking at a black and white picture of your doxie’s on a Christmas post and wondered what color they are. We adopted a doxie, named Sean, that was red. My friend has a red doxie that her son named Oscar. What’s funny is that he didn’t know about the Oscar Meyer Wiener commercials. His tag says Oscar M.W. their last name. lol Her son dressed up as a hot dog vendor and the dog was in a hot dog suit for Halloween a few years ago. rofl! I know you can picture how funny that was. You make the cutest recipe cards Andrea..Thanks! Banners and Ball Jars!!! what a perfect combination!!!! LOVEE!! Oh how I love those, so cute! Andrea these win the cuteness award for the year! Wow… love’ em. Awesome!